If you don’t know this songwriter and political satirist, you should. 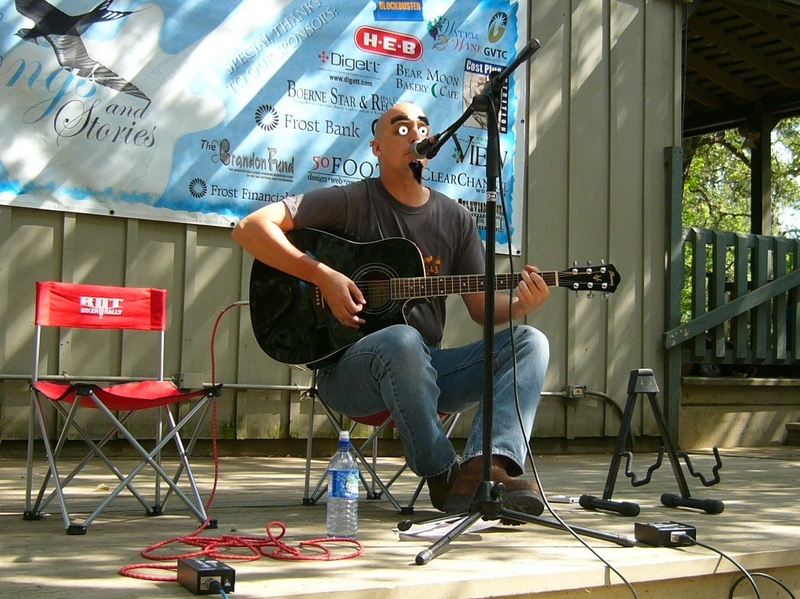 I saw him Sunday night past at the Radius Cafe’ in San Antonio with the F.A.C.T. crowd. Really nice guy and fantastic in concert. Between he and Tim Minchin, there is some really good thoughtful stuff going around. Not as surprised as I was, apparently. Found this while perusing old pictures. 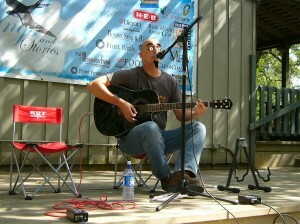 I went to see some friends perform at a charity event for a New Braunfels Nature Preserve and they asked me to sit in. I was on my motorcycle so didn’t have my own guitar, and my friends didn’t have straps for their guitars, so I had to sit on these tiny chairs. And at some point, I defaced myself. Althoug I do actually have buggy eyes like that. Man, this chair is uncomfortable. I guess you have to open it in a new browser window to get those flashing eyes. No vorpal blades, however. Long day so far: went to the local park to assist picking up garbage in a portion of the park they are about to re-open. About an hour and half or two hours of picking up trash, carrying a tire and rusted barrels up a small cliffside for the truck to get. They didn’t provide any water during our effort (wish they would have told us they weren’t providing anything), but they did provide iced tea and fajita tacos for lunch, so I can’t complain overly loud. Than I came home and did some brush cutting and cleaning for a pickup this coming week. More to do tomorrow. On the music front, I have a new song written about my puppy and I coming to loggerheads about her choosing to do her business in the house. I know she knows better, but she was mad I wasn’t playing with her. Fortunately, the idea that popped in my head happened to fit the chord progression I was working on, so it was a semi-happy outcome. I’ll have a POC up later this week, barring any studio sessions that crop up. And I have class all week, so that will cut into my time as well. Ah, song writing. I was quite honored to be on a song writing panel with the aforementioned pros of the industry! It is quite an interesting topic to discuss and impossible to have a “right way”. It’s the post-modernist’s dream where nothing can be certain or correct or known. Or nightmare. And if you think you’re a relativist, then you’re in heaven. Or hell. Just like in learning and education, everyone will have their own way of writing, and usually many forms and techniques depending on the blockage or inspiration. But they are “tried and true” ways that can at least grease the hamster wheel. I have only ever had, I think, about 10 songs that came out nearly fully formed: they’ve never been completely there, though some- like Silver– were near complete when they appeared. Some tweaking was required to keep it from falling into the usual bitter-sweet poignancy. Hector Saldana and Ron Young find it fairly straight forward to write somebody else’s songs- as do I- as they tend to have come up with the idea, which is often the hardest part. I find coming up with the proper slant on the idea the hard part, but once I get the tack I wish to take, it’s just a matter of time to get to the end. Sometimes the wind is just barely blowing tho and sometimes I am pointed so hard into that near-virtual creative wind it can be really slow going. 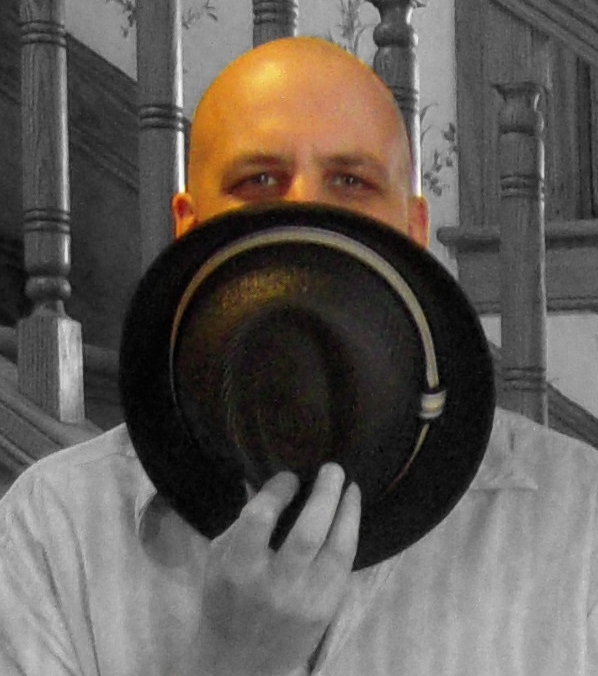 Butch Morgan tends to write songs the old fashioned way with pen and paper and a guitar. I may have given the impression that I do all my writing in the studio, but the great majority of my songs are based around acoustic instruments, primarily the guitar. If would just break down and buy that piano I’ve always wanted, I’d have more keyboardy songs. Maybe album #4. I have two broad ways of coming up with a new song. Most often, I get a phrase that I like or a story (or part of a story) I’d like to explore and go from there. Usually the story idea comes with a nice angle from which I can begin. For example, One For Now, is Shroedinger’s Cat gedanken from the cat’s point of view. A very amorous cat, probably. But then I like to combine ideas, so it is also an unrequited love story. And Feel The Way I Do– a song that’s been in the coffers for a few years and will make it to CD 3 OR just demo’ed…either way it’ll be up ere in a few weeks, if all goes well, my isn’t this a nice aside- is imagining Love was like Dilbert’s Ego and Insecurity and got up to leave one day. I also- proudly- managed to get the phrase “reticulated office lights” into that one. I’m a geek. On the other hand, I am writing a new song that started with some chord changes, which looks to be titled This Moment. It’s still in progress, but it’s about what a person does when they lose their faith. In a completely non-offensive way, of course. Of course. I’ve done a quick demo of it for place-keeping purposes, and should be recording that in the coming week. A good gig was had at the Tower of the America’s playing with Carl O’Laughlin, and two excellent musicians, Ron and Don (of whose last names I am unsure, though they apparently share a surname, being brothers and all). It is always a good time playing with professional and capable musicians. And getting people up and dancing? Fantastic! And now I have to deal with a lovely day of allergies. What is it about an allergy attack that makes me want pizza and Coca-Cola? A friend of mine has a last-minute need for a drummer so off I will go to the Tower of the America’s for New Years! Apparently the usual drummer’s wife is having a child so he will be unavailable. And that’s good for me. Now to bone up on my classic rock. Strangely, Auld Lang Syne isn’t listed. Ah well. Comments Off on New Years Show! CD #2 recording and etc. So I am begun on CD #2. I have plenty material and I am going through the Proof of Concept stages that will allow me to make the choices. I will be posting the POCs here so you may peruse them. POCs are more than Demos but not quite the happily finished and untouchable song. Although after they’ve been languishing a while, they may end up being called “finished”. IT’s the way they escape into the wild aether of the interwebs. The new album, as yet untitled, will most likely consist of a couple of songs I’ve had in my pocket for years, and new songs that have been around a couple of months or weeks and may still be wet behind the arrangement ears. Comments Off on CD #2 recording and etc. I am now the proud owner of Cakewalk’s new release and DAW overhaul: SONAR X1. It’s quite nice looking, and I can see some nice improvements to the workflow. Unfortunately, the overhaul has changed all the key-bindings, which means I will have to re-learn or re-enter all my old ones and all of the drop down menus have changed, which- again- means I’ll have to relearn them. Which is why I bought their release now, rather than in two months when the dot release updates and fixes have come out: so I can start learning the new system. That and it took nearly 24 hours to download it all due to a 20GB multi-session download package. Lots of early morning and late night checking on progress, but it’s on the HD! So far, however, I think it’s effected the stability of SONAR 8.5 just alittle as last night’s session had a couple of issues which had not occurred in a long, long, while. I use the 64 bit version of SONAR, usually, as it allows me access to lots and lots of RAM, making softsynths and smaplers use less hard drive resources. Alas, I switched from messing about in X1 to opening aclients project in 8.5 (to be fair, a project I hadn’t worked on since March) and the computer blue screened. Not a happy moment. Turns out, the I had to open the project in the 32-bit version. Stranger and stranger. But it all worked out. and the session went relatively curse free. Today then, I begin with X1 and record some basic tracks for CD#2 and begin learning the new system. Don’t forget you can buy my CD at CD Baby (better for me) or iTunes (not so better for me, but good for Apple) or you can still download my entire CD in one swell foop here. ProTools 9 is out now. It should allow me to use my MOTU I/O instead of having to dongle their DIGI00X interfaces. And they apparently finally bundled the OMF capabilities! That’s a saving of $500. Actually, that’s them finally realizing their [disparaging adjectives deleted] pay-to-play, ala carte, if-you-ave-to-ask-you-can’t-afford-it business model isn’t working. I did finally have to buy an iLok USB key, but it’s better than an iLok plus a $1200 dongle called a DIGI003. So it’s back-up and install time at G.O.Recording Studio. Also, SONAR X1 has been announced and they appear to have made some very nice work-flow improvements. SONAR is my go-to software so I am pretty excited about some of the new GUI features. It looks like they’ve also improved the file structure and ability to share files between projects. Yay! That’s a December purchase, tho, so it gives me time to sell my plasma and pimp my services. Yes, it’s 3:30am. Yes I started working. Hey: the coffee maker says 9:00 so I’ll go with that. I happen to know it’s wrong, but the coffee maker has great weight in my household nad I will overlook it’s overly enthusiastic concept of time for the moment. Download my Entangle Mental, the entire CD <–there , or better BUY IT at CDBaby or iTunes under “Entangle Mental” or “Balsa Racers”. Thank you! Comments Off on Upgrades! Updates! A Show! New Songs Soon! Picked up a gig at Taco garage in San Antonio, TX at 410 and Broadway from 6 to 8PM. Acoustic solo thing. I have three new songs I’ve done the proof of concept recordings on. One is just plain silly, but I’ve decided not to censor such inanities. Look for new songs- at least the POC’s- next week! Comments Off on A Show! New Songs Soon!